A BIG thank you to all who took today to get together and have a little fun and talk about what we do as music educators. Thank you to all who moderated and participated! Cannot tell you how much it means for you to help me out with this. Next #musedmot is in the dead of winter January 19th. Something a little different about this next one! Watch the after party video to learn more! DLP_DSM Hi to all #musedmot folks – take a look at http://t.co/mqy3yKuM FREE Courses, Lessons, and Resources for your school or studio. musiced20 “I do a beginning band activity with counting that would lend it self well to skip counting, now that I think about it. BandGirlSmith #musedmot Going to be checking in on-and-off…judging Band chair placements today, too! MrAhrens Good morning #musedmot. I’ll be lurking in the back from time to time. Looking fwd to your input. lessonlogs Hi everyone! Excited to spend the day with the #musedmot folks! Isn’t #technology great! heistes Unfortunately can’t participate in #musedmot. Drumline rehearsal 10:30-12:30, full band 1:30-4:30 and then leaving for a band competition!! noahkeitel Good morning #musedmot! Excited to hear everything you have to say today! It’s almost here! The 2nd running of Music Ed Motivation Day the multiplatform social media web day for music educators is close to just a week away with lots left to do! Mark your calendars, make sure you’re signed up to Twitter, the Music Teachers Facebook Group, and Google +..and DON’T BE AFRAID TO VOLUNTEER! Moderators still needed! 1.) Starting early in the morning on Facebook I will start posting topics for teachers to begin the conversations, they will be about anything from resources, to integrating, to unique ideas for the classroom. Be sure to search for http://www.facebook.com/groups/musicpln/ and ask for entrance so you can be a part of the action! Be sure to join in and share your tools, thoughts, and experiences about the Twitter topics. At 2 pm the #musedmot hashtag will switch to a back channel to share notes and thoughts about the Google Plus On Air Hangouts that begin at 2pm est. 3.) Starting at 2pm est Google plus Hangouts will begin. To join in a hangout visit the moderators G+ page some time during the week by clicking on their name on the official Motivation Day homepage. They will have a short post up on their wall where those who want to part take in the video discussion can signup. (If you have signed up to mod a G+ chat, no worries, I will send out a little message about it soon!) First come first serve and they can have up to 9 other people in the hangout while others can watch the chat live from the moderators homepage and ask questions or give comments in the comments box, later as each chat is automatically recorded onto Youtube for later. *There are many open spots for Google + moderators still available! Please consider moderating, the whole day is filled with great conversations because we have amazing moderators step up to the plate to get those conversations going! It’s the beginning of the year, you and your students are excited to start a new. New songs, new lessons, and new equipment. When it comes to any equipment in the classroom it’s important to lay down a set of rules and procedures on how to use it so students will know proper use and it will stay out of the grasp of the looming junk pile of broken, improperly used tools. Over the past week I’ve spent most of it laying down the laws of using our netbook carts while showing them how to maneuver the internet to http://www.quavermusic.com starting the process of getting almost 300 students onto my Teacher Admin Panel classes. It’s a long process of getting them acquainted to procedures and rules but it pays off when the tech projects begin later on in the year and my help line goes from 20 to 1 or 2. 1.) Be safe and respectful to the equipment. : Treat the technology as if it was your own. Two hands when carrying it, do not bang on it or throw it, be safe and be respectful at all times. 2.) Don’t do anything you wouldn’t want me to catch you doing. : I circulate around the room a lot during classes. If you are doing something on the computer you would not want me to catch you doing, then don’t do it. I can see perfectly clear if you are attempting to figure out the webcam or trying to quietly play the music video to Justin Bieber’s “Baby” on Youtube.. 3.) Follow directions. : Simple enough, follow the directions you are given that day to do on the computers. You will always be given a set of tasks for the computer and I expect you to follow and complete them. The main consequence for breaking any of the three rules is taking the equipment away and taking a break or leaving the room. I stay pretty much consistent with every rule and really have not had a problem yet. My students know that using the technology in my class is a privilege not a right and we do not HAVE to use it if they cannot treat it the right way! This week has been a veeerrryyy long battle trying to accomplish a long to do list along with everything else I have been pulled aside to fix or help with. 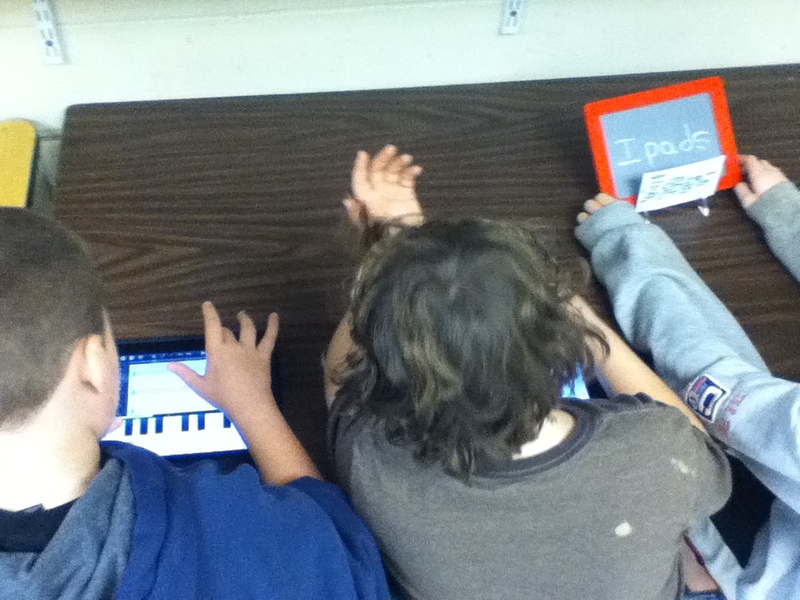 What has really been one of the few fantastic highlights of my week has been rhythm and beat centers for grades 3-5. I try to do centers once a month to give students a break from learning new things and play activities that reinforce the concepts they have gone over and should retain. I have a center bucket that is filled with over a dozen already created centers which I could easily have pulled out again, but I really like to try to come up with things that are new and different. 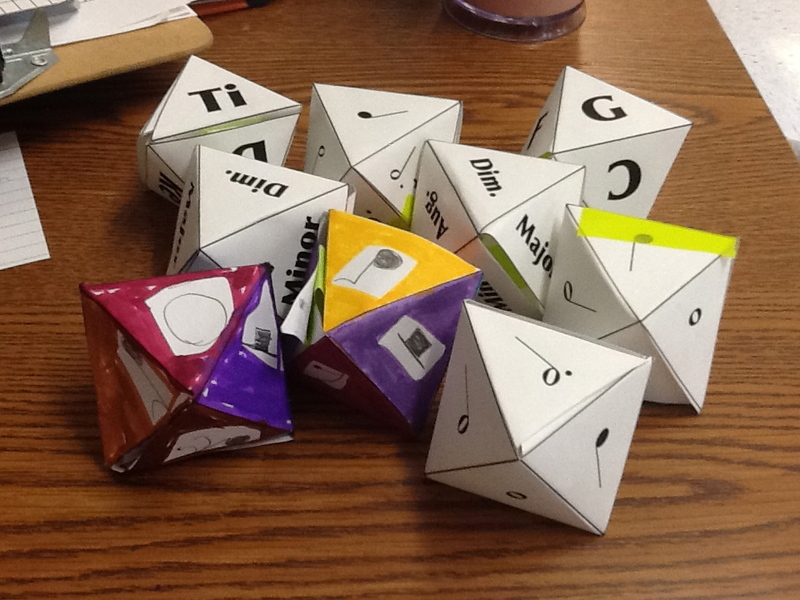 So I created 2 more brand new ones for this round of activities, Musical Dice and Bubble Rap Rhythms. Below you will find resources and instructions on how these wonderful activities work. Musical Dice: Origami at it’s finest. This activity is fun until you get to the part you have to fold and glue. Be warned, it will get messy and you might be folding a lot of dice together but it will be a great reward after they are all done. Have students cut out the template first. Color the dice making sure to draw a note or rest in each of the triangles. Ask them to make a slight fold along each of the black lines and it will eventually take an 8 sided dice shape. Bubble Rap Rhythms: Thanks to my friend Julia for this station coming to life! The students found it so tempting to just pop all of the wrap so I could only put out enough for each group one at a time to save the squares of awesomeness. Luckily I’ve got some left over!! Transfer that pattern to a worksheet. 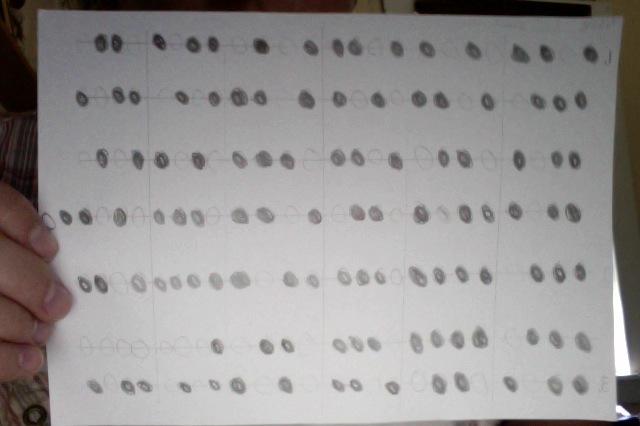 ( I drew mine out onto half sheets dividing the bubbles into 4 beat measures). If the bubble is popped then the bubble on the sheet is filled in if it is not popped then it is left alone on the worksheet. Have students finish the worksheet to the end even if the bubble wrap is done. After the worksheet is filled out they may pop any extra bubbles on their sheet of wrap and throw away. Have them then practice clapping their beats. A filled in bubble is one quarter note and a bubble that is left alone is a quarter rest. If they can clap their rhythm then have them move on to a boomwhacker to practice until time runs out! So there you have it, centers are a lot of hard work to get ready but they are a blast to watch in action! I still get excited for them because I’m pumped to have the opportunity to get my students working independently with the activities while I stroll around the room and have time for one on one instructional time.